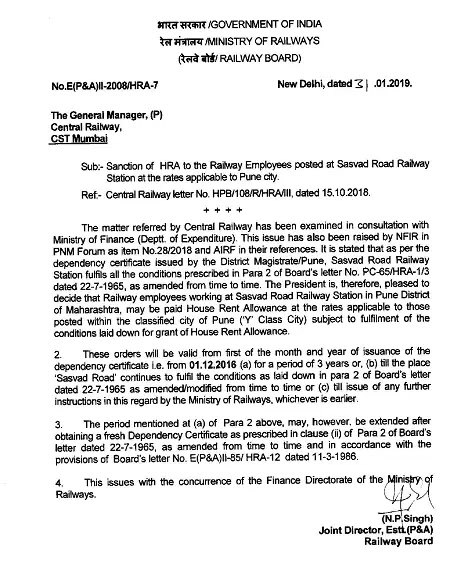 Sub:- Sanction of HRA to the Railway Employees posted at Sasvad Road Railway Station at the rates applicable to Pune city. Ref:- Central Railway letter No. HPB/108/R/HRAMII, dated 15.10.201 8. The matter referred by Central Railway has been examined in consultation with Ministry of Finance (Deptt. of Expenditure). This issue has also been raised by NFIR in PNM Forum as item No.28/2018 and AIRF in their references. It is stated that as per the dependency certificate issued by the District Magistrate/Pune, Sasvad Road Railway Station fulfils all the conditions prescribed in Para 2 of Board’s letter No. PC-6S/HRA-1/3 dated 22-7-1965, as amended from time to time. The President is, therefore, pleased to decide that Railway employees working at Sasvad Road Railway Station in Pune District of Maharashtra, may be paid House Rent Allowance at the rates applicable to those posted within the classified city of Pune (‘Y’ Class City) subject to fulfillment of the conditions laid down for grant of House Rent Allowance. 2. These orders will be valid from first of the month and year of issuance of the dependency certificate i.e. from 01.12.2016 (a) for a period of 3 years or, (b) till the place ‘Sasvad Road’ continues to fulfill the conditions as laid down in para 2 of Board's letter dated 22-7-1965 as amended/modified from time to time or (c) till issue of any further instructions in this regard by the Ministry of Railways, whichever is earlier. 3. The period mentioned at (a) of Para 2 above, may, however, be extended after obtaining a fresh Dependency Certificate as prescribed in clause (ii) of Para 2 of Board's letter dated 22-7-1965, as amended from time to time and in accordance with the provisions of Board’s letter No. E(P&A)II-85/ HRA-12 dated 11-3-1986. 4. This issues with the concurrence of the Finance Directorate of the Railways.